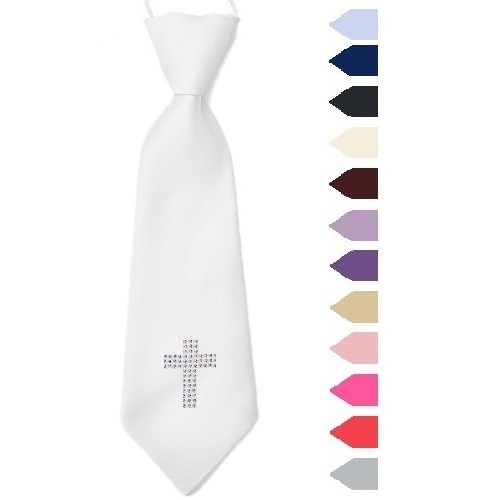 Add a dash of colour and sparkle to your little boy's christening outfit with this satin tie, lavishly hand decorated on the front with a diamante cross, pre tied for the perfect knot everytime. These ties have an elasticated neckband simply for ease and safety. Many colours to choose from including including black, burgundy, gold, lilac, light pink, cerise pink, purple, red, sky blue, navy blue, silver / grey (for ivory or white, please see individual listings). Length - 9" (23cms) Suitable for boy's 6 months to 5 years. Completely brand new, perfect for a christening / baptism. One tie supplied, image for illustration purposes.